The transitional regions where nomadic and sedentary culture meets has long been valued as a buffer state for civilizations against the rampaging steppe. These border regions have held a love-hate relationship with their neighboring sedentary states, prizing the rugged martial abilities of these horse-borne nomads while despising their all too frequent raiding and rebellious nature./n/nIn some ways, the Karakalpak (Turkish for "Black Hats", the coloqiual name given to them by the Russians, who refered to them as Chernye Klobuki meaning the very same) escaped the more negatives of the nomad-sedentary relationship in their migration and semi-sedentary settling along the frontier of Rus territory and Pecheneg and later Cuman territory. These Turkish nomads arrived in the late 11th and 12th centuries, settling primarily to the south of Kiev and Pereiaslav./n/nWith their widespread service as cavalry mercenaries for the feuding Rus Princes, the Karakalpak have come into a bountiful wealth unavailable to most of their rugged steppe kin. Their war-dress is mixture of Russian and Turkic Fashions, the latter of which already was beholden to a wide variety of influences from Germanic West to Turkic and Iranian East. 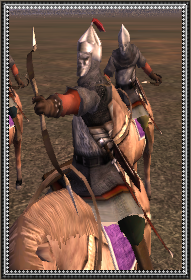 With mail shirts, light round shield and adorned helmet and face mask, these nobles are potent medium horse archers able to get into the fray if they've softened up their enemies with sufficent archery.